Manchester United have managed to claim their twelfth Football Association Cup after their triumph over Crystal Palace on the 21st of April 2016. United endured a tense match, in which they had to come back from behind to beat their opponents by two goals to one. Jason Puncheon fired Palace into the lead with a fabulous strike that managed to curve its way past Manchester United’s goalkeeper – David De Gea. A few minutes later, Mata equalized after an abrupt change in style of play by United. Jesse Lingard smashed home the winner with a stunning volley in extra time that made its way to the top corner of Hennessey’s net. The win secured Manchester United’s 12th FA Cup Trophy and their first in over a decade, putting them level with North London club Arsenal – who brought their tally to 12 trophies after winning the 2014 and 2015 FA Cups. United had held the honor of the most FA Cup titles when they beat Newcastle in their famous treble winning season of 1999. They held the record for over 10 years, but only winning the competition once in that period, meanwhile Arsenal managed to catch up and surpass United with a total of 5 wins in over a decade. Manchester United’s 2016 FA Cup success came amidst a total squad rebuild under Dutch manager Louis Van Gaal – who spent over £250 million in transfers during his 2 year reign at the club. United’s journey to their 12th FA Cup was an interesting and motivational story of hard work and dedication under increasing pressure from their fans for some silverware. Louis Van Gaal’s men began their FA Cup campaign with a home match against League One side Sheffield United. The third tier football side gave United a good run for their money in a 1-0 United win. This fixture eased off the pressure faced by the United players, after a home loss to Southampton in the match prior to this. Wayne Rooney, Juan Mata and Daley Blind all featured on the score sheet as Manchester United thumped Derby County and made their way to the fifth round. Manchester United were yet to meet an opponent in the same league as them, as they were to face lower league side Shrewsbury. United dismantled the Shrewsbury defense in their emphatic 3-0 win – with Juan Mata, Chris Smalling and Jesse Lingard all contributing to the scoresheet. They finally faced Premier League opponents – West Ham, who were on an unbelievable run of form. The Hammers scored the first goal of the match in the 68th minute to put a dent in United’s hopes of progression, but Anthony Martial became United’s hero after equalizing in the 83rd minute of the match and forced West Ham to settle for a draw with a replay to come. Manchester United managed to knock their opponents out and secure a spot in the semi-finals to be played at Wembley. Marcus Rashford and Marouane Fellaini scored the two United goals that sunk West Ham. A tense match awaited Manchester United at Wembley, but they managed to push their way past Everton to reach the final. Marouane Fellaini scored against his former club to put United in the lead and David De Gea continued his heroics after saving a 57th minute penalty by Romelu Lukaku. Everton were then drawn level after Chris Smalling scored a bizarre own goal in the 75th minute. With only 15 minutes to go, United had only one man to look to for a winner – and he produced. Anthony Martial scored against the Toffees with just minutes to spare, firing United to their 19th FA Cup final. Manchester United faced Crystal Palace in a tense match at Wembley in the battle for the 2016 FA Cup title – a match which proved to be crucial to the United fans after waiting almost half a decade for some silverware. Jason Puncheon scored the first goal of the match during the second half, but a few minutes later had Juan Mata tie the scores, and Jesse Lingard bagged the winner during extra time with a stunning volley from the edge of the penalty area. The win saw Louis van Gaal jumping with joy after what has been anything but a relaxing stint for the Dutchman. 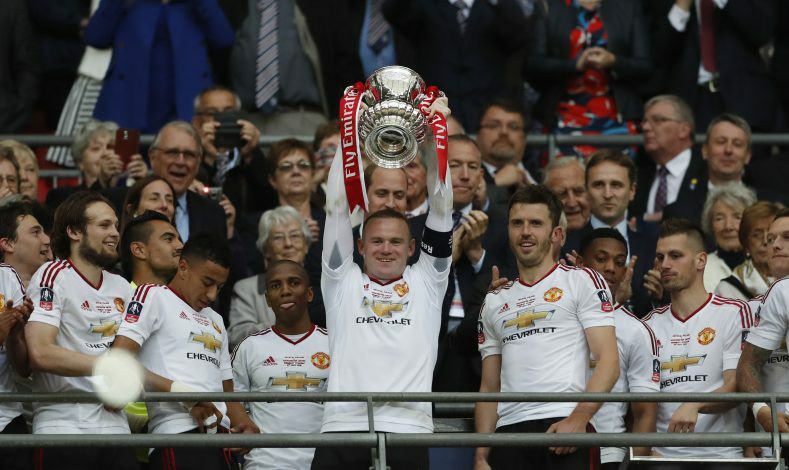 Manchester United captain, Wayne Rooney believes that their FA Cup triumph will be a motivational push for youngsters in the squad and will increase their desire to win trophies. He also mentioned that the United fans have been very patient with the club after waiting 3 years for some silverware.